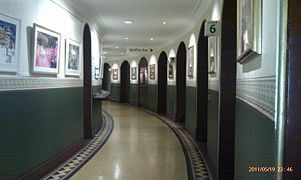 Amphi corridor on the ground floor, facing West from Door 6. The Door 9 porch at night. 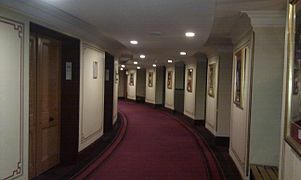 Second Tier corridor, facing West from Door 6. Fluted aluminium roof and diffuser discs seen from the Gallery. The glazed roof and vertical struts supporting the fluted aluminium ceiling, beneath the wooden floor. "The Building" (PDF). Royal Albert Hall. Retrieved 17 June 2011. در ویکی‌انبار پرونده‌هایی دربارهٔ رویال آلبرت هال موجود است. این صفحه آخرین‌بار در ‏۲۳ ژانویهٔ ۲۰۱۹ ساعت ‏۲۲:۳۶ ویرایش شده‌است.